This recipe for White House Eggnog was submitted by L. Jamison. In large container, combine the eggnog, bourbon, rum, brandy, vanilla and nutmeg, mixing well. Refrigerate until just before serving. 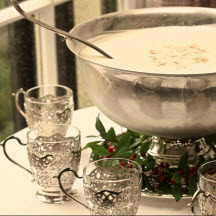 At serving time, pour the eggnog into a punch bowl. Scoop small chunks the ice cream and float in the eggnog.